โลแกน เลอร์แมน ที่แอปเปิ้ลสโตร์ โซโฮ นิวยอร์กซิตี้ ปี 2013. ↑ Staff (January 19, 2006). "BIRTHDAYS". Houston Chronicle. สืบค้นเมื่อ December 11, 2012. ↑ "Rising Actors Under 25: Logan Lerman". CW Detroit. July 24, 2012. สืบค้นเมื่อ December 11, 2012. ↑ Lang, Brent (January 22, 2016). "Sundance: Logan Lerman on What Drew Him to 'Indignation,' Learning to Butcher". Variety. สืบค้นเมื่อ January 25, 2016. I share very similar views to Marcus. I come from a Jewish family, as well. I definitely identify myself as being Jewish, and I’m proud of my background. But I have the same questions as Marcus has in his mind about life and religion. I’m questioning — I question things and I have no answers. ↑ "Jack & Bobby's Matt Long & Logan Lerman". People Magazine. 2004-10-25. สืบค้นเมื่อ 2010-03-01. ↑ "Logan facts". 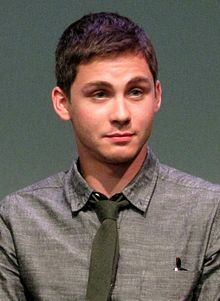 LoganLerman.com. 2004. สืบค้นเมื่อ 2010-03-01. ↑ "Lerman & Son: About". Lerman & Son Orthotics & Prosthetics. 2009. สืบค้นเมื่อ 2010-03-01. ↑ Ordoña, Michael (2009-08-20). "The Performance: Logan Lerman". สืบค้นเมื่อ 2009-08-20. ↑ Priggé, Steven (2010-02-12). "An Interview with Logan Lerman of "Percy Jackson & the Olympians"". BlackBook Magazine. สืบค้นเมื่อ 2010-03-01. ↑ "37th Annual Saturn Award Nominations". SciFi Mania. February 25, 2011. Archived from the original on April 30, 2011. สืบค้นเมื่อ October 13, 2011. ↑ Swift, Andy (May 18, 2012). "'Vampire Diaries' Leads Teen Choice Awards With 6 Nominations". Hollywood Life. สืบค้นเมื่อ May 18, 2012. ↑ Wilkinson, Amy (March 6, 2013). "Emma Watson's Movie Awards 'Perks'? Three Nominations!". MTV. สืบค้นเมื่อ March 7, 2013. ↑ "Teen Choice Awards Nominees 2013 Announced". Huffington Post. May 22, 2013. สืบค้นเมื่อ May 22, 2013. ↑ Deming, Mark (July 16, 2013). "'The Heat' Leaves 'Iron Man 3′ out in the Cold in Teen Choice Awards Nominations". Yahoo! Movies. สืบค้นเมื่อ August 2, 2013. หน้านี้แก้ไขล่าสุดเมื่อวันที่ 27 สิงหาคม 2560 เวลา 06:03 น.